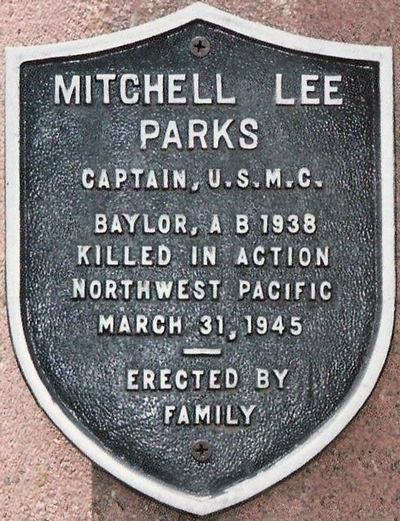 Mitchell L. Parks, the son of R.E. Lee and Judy Parks was born in Elkhart, Texas in 1917. He graduated from Palestine High School and Allen Academy before attending Baylor University where he was a star in baseball (1936-1937), football and basketball. 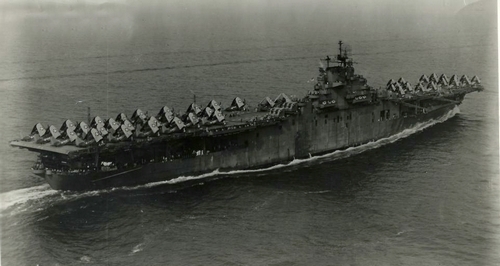 Parks entered service with the Marine Corps in September 1941 and trained at Corpus Christi, Texas and Mojave, California. Captain Parks was a fighter pilot with VMF-221 squadron aboard the USS Bunker Hill (CV-17) aircraft carrier. He was participating in air raids on Palau, Yap, Ulithi, and Woleai in the Palau Islands when he was killed in action on March 31, 1945. His mother (Judy) and wife (Doris), were notified he was missing in late April, but it was not until May 5 they were informed he had been killed. Mitchell Parks earned the Air Medal with Gold Star and the Purple Heart. His body was never recovered. He is remembered at the Honolulu Memorial in Hawaii and the Garden of Memories at Elkhart, Texas.